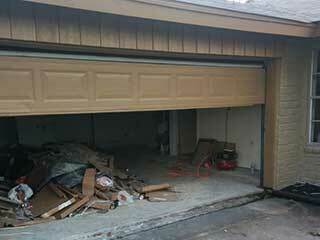 One of the problems encountered with garage doors is the sudden or gradual emergence of gaps. This could be a gap between two panels or a gap between the frame and the garage door tracks. It is important to quickly address these spaces when they occur or they can render garage insulation useless. One way of solving gap problems is to seal them. If it's a crack between the door frame and the concrete, it's possible to apply concrete mixture or a sealant if the space is not that big. Bear in mind that filling gaps in with concrete and colloidal sealants is only good for parts that are not meant to move. These solutions can't be used to solve spaces between the door panels and the jamb, or gaps around the garage door hinge. If the gap has been caused by an inaccurate alignment of the door panels, the best solution is to repair the structure of the door. Sealing can provide a solution to some extent but it won't fix things in the long run. Furthermore, misalignments can lead to additional problems in the future. It can cause imbalance in the distribution of the door's weight and will consequently cause other parts to wear out prematurely. This is especially true for swing hung and overhead garage doors which rely on hinges and garage door springs to operate. A garage door panel replacement may also be an appropriate solution. Sometimes, the panel may have become too worn out to keep its desired frame. Time To Replace Your Door? If your door is already quite old, a replacement may be the right solution. At some point, constant maintenance will reach a point where it is no longer cost effective. When you reach this point, replacing your door will provide a better financial and long-term choice. To discuss your options or to obtain more advice, don't hesitate to get in touch with our professionals at Garage Door Repair Missouri City. We'll be glad to hear from you!